Garden Grove Cooling System - Morrison Tire Inc. Your vehicle’s cooling system is critical to engine operation. The cooling system consists of a number of components working together to circulate a liquid called “coolant” in order to keep the engine running at the optimal operating temperature. If the engine temperature is too low, the fuel economy will suffer and emissions will rise. If the temperature is allowed to get too hot for too long, the engine will break down. Fluid leaks, discolored fluid, and overheating can be an indication your cooling system is in need of repair. Allow us at Morrison Tire to inspect your cooling system to make sure it is working correctly. Our certified ASE technicians can take readings of operating temperature and coolant level as well as visually inspect your vehicle's radiator, belts, hoses, and other components. Proper maintenance is critical to cooling system performance. Depending on your vehicle make and model, a cooling system fluid exchange service is also recommend. This service will aid in breaking down rust, corrosion, and mineral deposits that can build up within the cooling system. 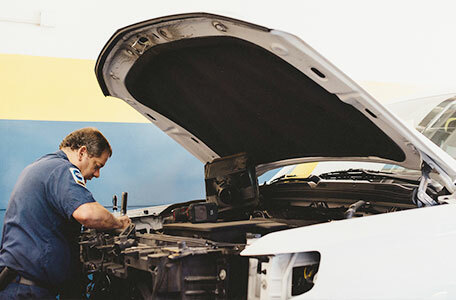 Contact your service advisor today to find more information about your vehicle's cooling system and how you can benefit from regularly scheduled cooling system maintenance!